This is a sponsored post but the words, photos and opinions are 100% mine and Wesley’s. I have to admit, and my mom will attest to this, I’m not always a big breakfast guy. I do love it, don’t get me wrong. And I really do understand that it is the most important meal of the day. But, there is always something about the hustle and bustle of getting ready for a busy day, that it’s easy to let a good breakfast fall by the yummy wayside. Well, let me tell you something, I have come up with a recipe that is fast, packed with protein, and is so yummy, you’ll be scratching your head wondering how come it’s taken this long for us to tell you about it. 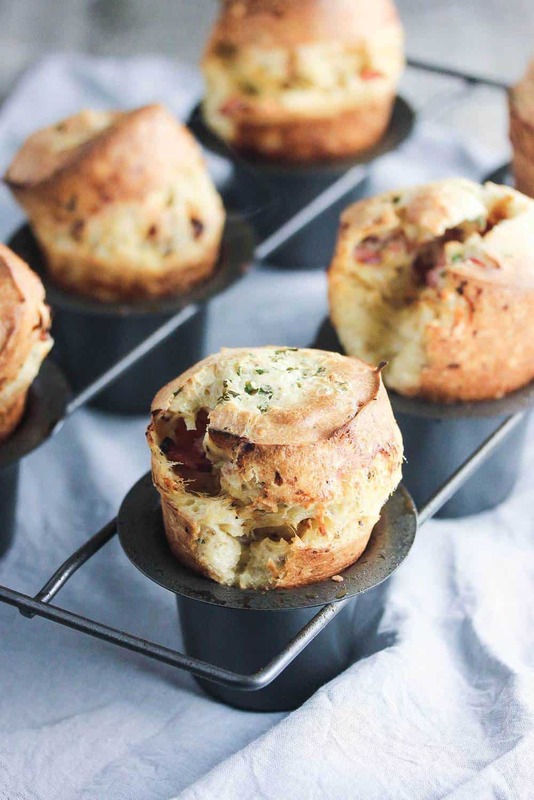 So, let’s talk about this Ham and Gruyere Savory Popovers recipe, starring one of our favorite breakfast proteins of all time: Smithfield Anytime Favorites Ham! We cannot rave enough about these gorgeous and delicious popovers. 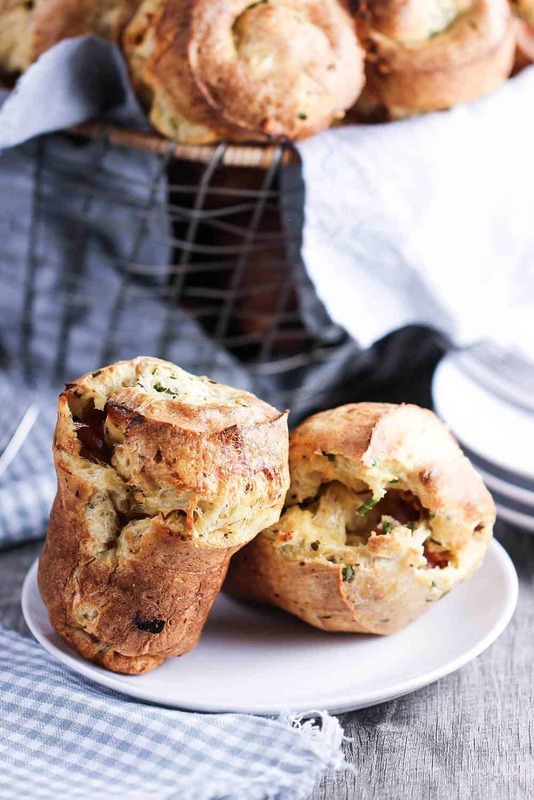 We’ve reimagined the basic popover recipe, which is usually just bread and some butter (which, of course, is still delicious), into a savory treat that is packed with some of our most favorite savory ingredients in the world: Gruyere cheese, sun-dried tomatoes, chives, black pepper…and ham! Now, there are a few simple tricks to keep in mind when preparing this ideal breakfast (which by the way, is absolutely wonderful any time of the day) that will ensure you get perfectly risen and gloriously yummy popovers every time…in about a half hour! 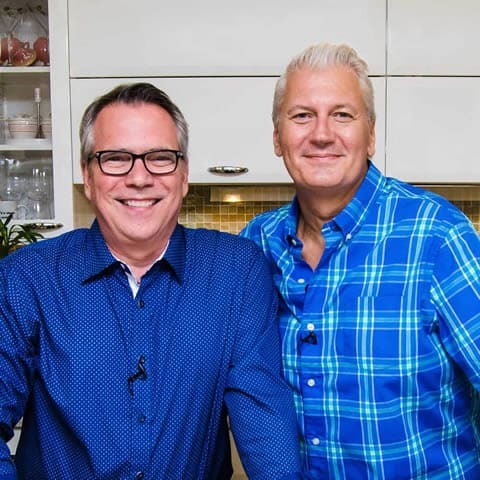 As you’ve heard me say many times, a recipe is only as good as the ingredients that you choose to create it with. So, it is essential to start with a good-quality ham. 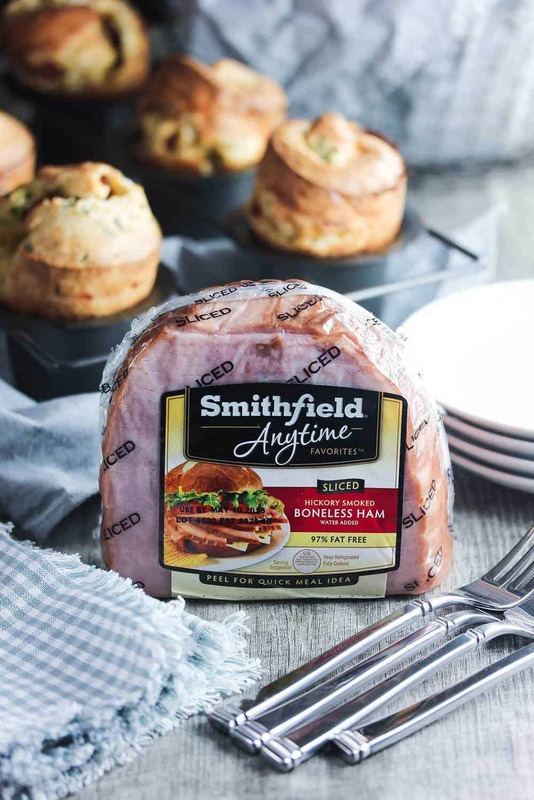 I have used Smithfield products for many, many years, and we just adore the Smithfield Anytime Favorites Ham, because you get the legendary Smithfield taste without having to prepare a full spiral ham. And we love that we can choose from 20 different cuts of Anytime Favorites – including sliced, diced, chops and steaks. Superior taste, presented in a way that makes life in the kitchen less stressful and more productive. Now that’s what you call a win! Now, as mentioned, there are a few critical steps that need to be taken to make sure you achieve the classic popover taste, texture and appearance. First, it’s not 100% required, but I find using a popover pan always delivers the best results. You can make this recipe in a muffin tin, no problem, you just most likely won’t achieve that high elevation of bread with the glorious hollow inside. A few other key points to follow: All ingredients should be at room temperature. For the milk, I measure into a microwave-safe measuring cup, and then pop into the microwave on high for about 1 minute. This barely warms it up, which is perfect, but don’t let it come to a boil! Another super important thing to remember is: NO PEEKING! Follow the baking instructions exactly, and don’t open that door too soon, or your beautiful popovers will deflate! And of course, you can “reimagine” these popovers with your own favorite filling ingredients along with Smithfield Anytime Favorites Ham. Just don’t overdo it! Too much filling will prevent the popovers from reaching their beautiful heights! Now you’ve got the makings and the know-how to make the best savory popovers in town! Just a word of warning, when you do open that oven door, and you see these beautifully puffed gems, and that heavenly smell hits you – your heart may just skip a beat. Just so you know. They are really that impressive. And one of the easiest breakfasts you’ll ever make. 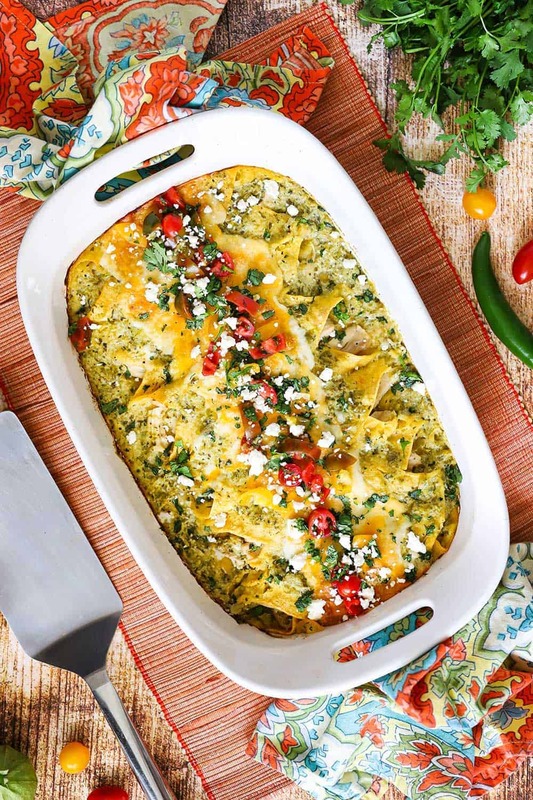 When you serve these to family and friends, whether a busy week morning or a relaxing weekend or a special occasion, you’ll be a kitchen superstar, without a doubt. 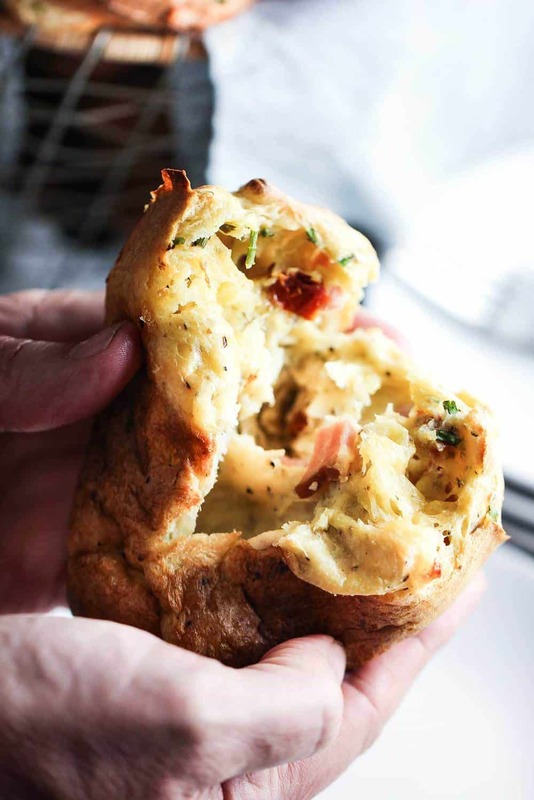 We are so thrilled to share this Ham and Gruyere Savory Popover recipe with you. All the flavors come together to make a breakfast treat that is magical anytime of the day. And we couldn’t imagine these incredible puffs of extreme yumminess without the wonderful taste and ease of Smithfield Anytime Favorites Ham. Go with quality in your cooking endeavors, and you’ll never be disappointed. That’s why we love Smithfield so much! Add pre-diced, cubed or sliced ham into eggs, waffles, or as a side with your toast to kick start your morning or end your day on a high note. Now, it’s time to make this awesome Ham and Gruyere Savory Popovers recipe! This Ham and Gruyere Savory Popovers recipe is a real keeper. The Loon flipped for this when I brought a basket of these to the breakfast table. We love using a popover pan to ensure the perfect height and texture, but you could also use a muffin pan, too. 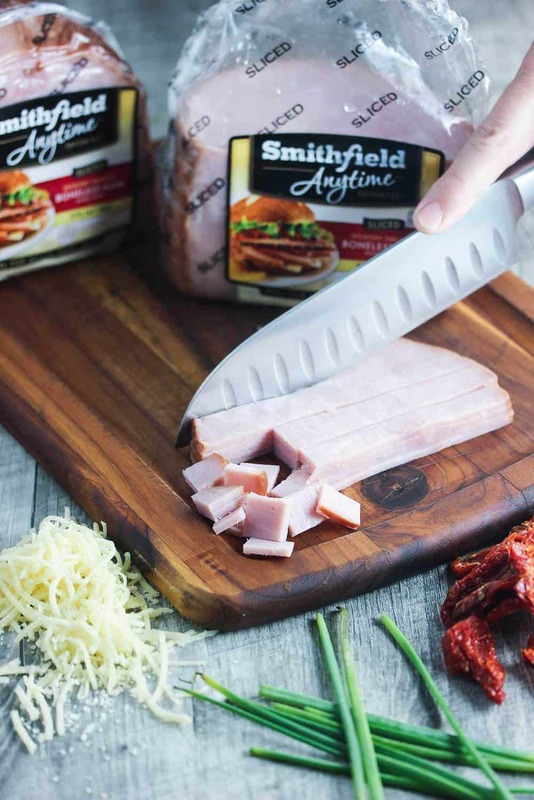 And of course, you must use top-notch ingredients, like Smithfield Anytime Favorites Ham! NOTE: You will most likely have a little batter left over if using a standard popover pan. I usually save the leftover over batter and make 1 or 2 after the first batch is done. And remember: Room temperature ingredients and no peeking into the oven until time is up! Pre-heat the oven to 425°F. Place the pan in the oven a couple minutes before you are ready to the molds with the batter. Sift together the flour and salt into a large bowl. Whisk together the eggs, milk, butter and pepper in a separate bowl. Add egg mixture to flour mixture and stir with a wooden spoon until combined (okay if some lumps remain). Take the pan from the oven and spray liberally with the cooking spray. Using a ladle or large spoon, fill each mold just over half way with the batter. Distributing equally, add the cheese, ham, tomatoes and chives on top of the batter in each mold. Top with just enough batter to nearly reach the top of each mold. (You may have some batter left over). Place in the oven and bake for exactly 15 minutes, then reduce the temperature to 350°F and bake for another 18 minutes. DO NOT OPEN THE OVEN DURING BAKING TIME. Remove from oven and carefully take the popovers out of the molds. Gently prick the sides of the popovers with a toothpick to allow steam to escape. Very cool recipe! By the way, in college I always chose a the easiest recipes theme for my theses. On this website https://essayexplorer.com/review/paperell/ you can find a service, which will make you an essay on any topic and you’ll be satisfiesd.